We had the honor of reviewing the "Operator" band from RE Factor Tactical. The company was gracious enough to send one of his bands for us to try out and review. My husband served with the USMC for four years and then entered into the Army Reserves. 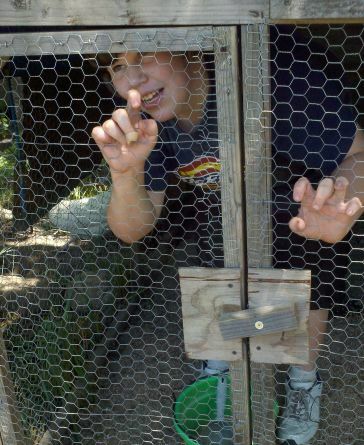 He is a hunter, a camper, and a prepper. He was a perfect candidate to give this band a work out. The Operator band is many items in one. The band has the following equipment attached and hidden inside: 12 feet (yes, 12 feet) of 550 lb. paracord, 30 feet of 80 pound fishing line, a fish hook, a handcuff key, a P51 can opener, a piece of flint that can also serve as a weight on your fishing line, and a snare wire. Pretty amazing, huh? And the neatest part is that it was developed by a real Special Forces graduate and made by combat veterans. 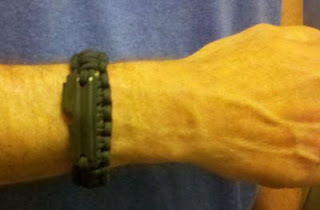 My first impression of the RE Factor Tactical Operator band is that it is very well made. I love that it has so many items built into it. It would be a great addition to anyone's Bug-Out-Bag, hunting gear, or any outdoor activity. If you do not want to wear it as a bracelet, you can clip it onto a rifle sling, belt buckle, or backpack strap. So, my first impression, straight out of the package was "I love it!" After wearing the band a few days my opinion of the band has only gotten better. It is really comfortable to wear. The band lays flat on the wrist and isn't bulky. The items are well concealed and the band is not just "thrown together". The band looks really professional and is made well. I only wear my wedding ring and have never been one to wear jewelry at all but I have been wearing it and I like it. My wife thinks it looks good on my wrist. What do you think? Anyway, without taking the band apart, I was able to start a fire with the flint with no problem. One strike is all it took. I also tried out the P51 and it is very good quality and can also be used without removing it form the band. All in all, I love the tactical band and I can't wait to pick up a few more of them. I highly recommend this band! Frugal Living Video Blog Series #3: Stocking up! This is the third video blog in the "Frugal Living" series. This short video (less than a minute) talks about stocking up on things when you find them on sale. Enjoy! Bubba is my 15 year old son. Bless his heart, he gets himself into such situations; hence, the title. Again! If you remember back a few months there was a post, "Poor Bubba" where he got himself stuck in mud up past his boots and could not get out. Well, he's done it again! 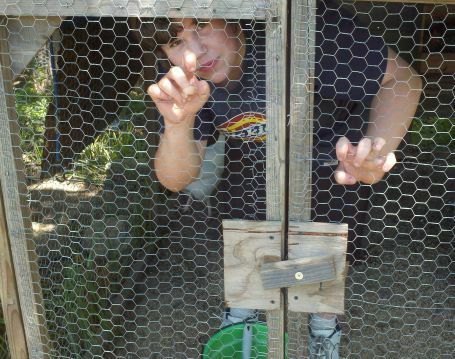 Yep, he's locked in one of the chicken coops. 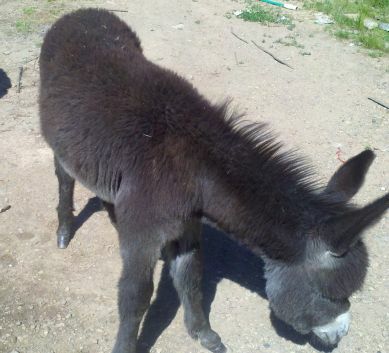 Apparently, Jasper (the baby donkey) and his momma Minnie wanted to follow him in and eat some of the chicken feed so Bub closed the door behind him. Jasper didn't appreciate it and locked him in. See the wood piece there on the door, Jasper used his nose to turn it and locked Bub inside. Bub didn't appreciate me running to get the camera before releasing him but this moment HAD to be reported! This video blog post is 2nd in the series over Frugal Living. In this video blog, "Countrified Hicks" talks about how you should not waste anything. Here is the link to the 1st post in the series: Click here! How to make the Oatmeal Packets she talks about in the video. Here is the first video blog post on frugal living that we have done. Watch the video and hear "Countrified Hicks" talk about dehydrating, canning butter, spice rubs, jam, jelly, etc. Click on the "recipe" tab to find some of the recipes she mentions. Here is the link to the 2nd video in the series. Click here! It is spring time but it sure doesn't feel like it. We had 80 degree weather for awhile and then overnight, the temperature dropped 30 degrees and it is cold again. Parts of Oklahoma, Arkansas, and Kansas all got some snow. Gardens and trees are ruined. Luckily, we did not get snow in our part of the woods. Yesterday was cool and cloudy and I was craving fish so I sent my hubby and oldest son down to the lake to catch a few bass. They didn't disappoint. They caught several and brought home 2 for our supper. Only hubby and I were eating so we brought home only what we needed. We had a wonderful dinner of fresh caught bass fillets that didn't cost us a penny and father and son spent some quality time together. Yep, it was a good day!